GEEK SPEAK: NOW THAT IS COFFEE! This strip isn’t based on real-life experiences, yet, but it’s probably just a matter of time. It’s no secret that I have a deep and committed affinity for coffee. Coffee is something of a ritual in the morning. First I start twenty ounces of water heating in the microwave for five minutes, so that it’s not boiling but still hot enough to brew. While the water is heating I measure and grind the beans. After the beans have been ground I add five slightly rounded scoops of fresh ground coffee to the bottom of my coffee press. By this time the water is hot so I pour it over the grounds in the bottom of the press, slowly so it evenly saturates all of the grounds. Then I put the lid on the press and set a timer for five minutes to let the grounds steep in the hot water. After five minutes I press down and the coffee is ready. It goes into a cup, no cream or sugar, just straight black nirvana. First I inhale the aroma, then I take a sip, then I sing “coffee” in a reasonable approximation of rich baritone. 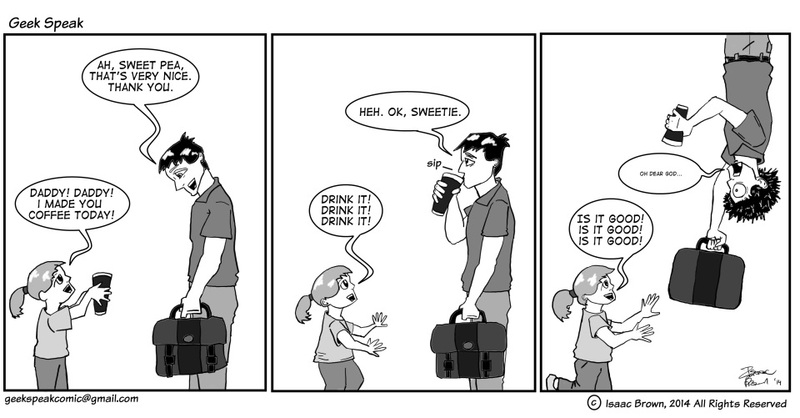 My not-quite-three-year-old daughter has started singing “coffee” back at me. It’s going to be a long time before she can drink any herself, but I take some pride in the knowledge that in at least this one small way I’m raising my daughter right. meaning to write about them ever since. It’s not the purpose of the blog to advocate for anything, per se, but when I find people doing worthy work I feel like it’s worth sharing. The Hero Initiative is a 501 (c) (3) organization providing support to veteran comic book creators in the form of financial assistance and services. Many artists in the comic book industry may be recognizable names, and their work might be treasured, but many of them also worked for a paycheck from the publisher. Much like any job they were given assignments and deadlines, they had regular working hours and the occasional overtime, and they took home a paycheck. While many veteran artists and creators have fans, in most cases it’s not the kind of celebrity that comes with fabulous wealth. In many cases appearing at conventions, while a fun part of the job, is still just that, part of the job. Like anyone else, when the job ends, so does the paycheck. When the money goes away, hard times follow. Comic book illustrators and other artists are especially vulnerable to this as many of them work on a freelance basis. Unfortunately life doesn’t wait for you to find work to throw up obstacles in the form of health problems, overdue bills, or just buying food. This is the reason the Hero Initiative exists. The Hero Initiative is “the first-ever federally chartered not-for-profit corporation dedicated strictly to helping comic book creators in need.” To date they have allocated over $500k in financial aid and services to comic book creators in need. In addition to financial assistance the Hero Initiative also provides services in the form of financial advisers and assistance with finding a path back to paying work. From a fan perspective they also do some really cool promotional work. One such promotion was the “JLA 100 Project.” When Justice League America reached its fiftieth issue D.C. published the book with a limited run of “blank covers.” The Hero Initiative picked up 100 of these and commissioned artists to illustrate the covers. There’s a lot of amazing work, and you can see all of them here. The commissioned books are then auctioned off and the proceeds go to the Hero Initiative to provide assistance for struggling comic book veterans. Very cool, highly collectible, and for a great cause. Everyone wins. It’s more difficult for me to describe the work this group does than it is for the artists who’ve received their assistance, so I’ll leave it with this: Hero Initiative’s Success Stories. As soon as I can work out how it’s done I’ll be placing a permanent link to the Hero Initiative on my blog. Take a moment to check out their website. They do great work for a community that created the characters and stories we all enjoy.